To receive further updates on this Electronic Arts, Inc. (NASDAQ:EA) trade as well as an alert when it’s time to take profits, sign up for a risk-free trial of Power Options Weekly today. This morning I’m recommending a bearish trade on Electronic Arts, Inc. (NASDAQ:EA), the video game developer and publisher. My indicators continue to give strong bullish signals, but I would still consider the upswing over the last six weeks to be characteristic of a bear-market rally. It’s been a very sharp and very quick advance that may have gone too far, too fast. Bear-market rallies typically retrace about 50%-75% of the prior downside move. And at its peak this week, the S&P 500 had retraced about 400 points of its nearly 600-point decline from October to December. Still, readings on overall market breadth are excellent. For example, the ratio of advancing stocks to declining stocks and the number of stocks trading above their 50-day moving averages are very positive right now. As my regular readers know, I am never one to try to buck the Fed or the tape. The put option I’m recommending on EA is, therefore, portfolio insurance on a stock that hasn’t been performing well. EA reported earnings after the market close on Feb. 4, and the numbers were not positive. EA missed earnings per share estimates and it opened more than 10% lower the next day. The company missed its revenue guidance for this quarter by $86 million, and it lowered the guidance for revenue in 2019 to $4.875 billion from $5.15 billion. I’ve said before that companies need to put up big numbers in this market environment, and EA’s performance the last few days is a good example of why. If we look at a daily chart for EA, we see the stock is heading down toward its 52-week low from December of 2018. The $93 level was already acting as resistance before EA reported earnings, and after the fall, it is more likely to retest its old support below $74, which may not hold. EA is also trading below its 50-day moving average, which presents another challenge to the already struggling stock. Both the technical and fundamental picture look bad for this company in the short term, and that’s why I’ve recommended a bearish put option. Buy to open the Electronic Arts, Inc. (EA) April 18th $75 Puts (EA190418P00075000) at $1.70 or lower. Note: The Good Friday holiday falls on April 19th, 2019. Because U.S. markets will be closed that day, April monthly options will expire the day before, on April 18th, 2019. 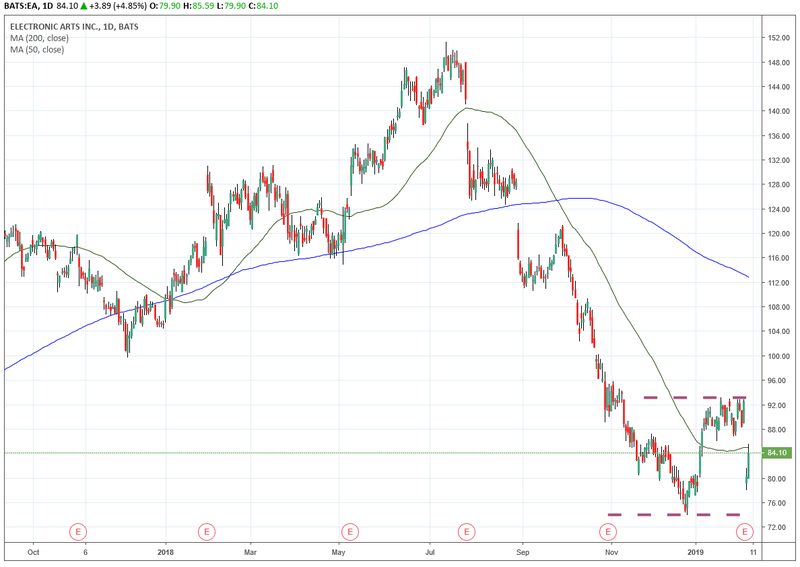 Article printed from InvestorPlace Media, https://investorplace.com/2019/02/ea-could-head-toward-its-52-week-lows-after-disappointing-earnings/.